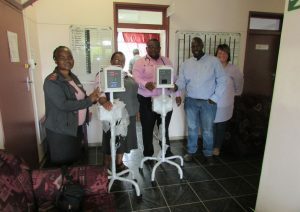 Thembekile Kanise (TK), the Director of Catholic Development Centre, Mthatha handing over 3 monitors to the Maclear General Hospital CEO, Dr N. L. Mashiyi, Sr May and Sr Notabo who are in charge of the labour and neonatal wards at the Maclear General Hospital. According to the CEO, they have asked the Department of Health for these for a very long time, but to no avail. Through bringing it to the attention of TK, who in turn contacted Ikhala Trust, we were able to make it happen through funds received from the VW Trust. Thank you, TK, for caring enough to let us know that we could support something different but life-giving! !